These pages help to show what it was like to be at school in the later years of Queen Victoria's reign. They use entries from the official Log Books of local schools, which can often tell us quite a lot about life in the whole community and not just the school itself. Most children did not go to school at the start of Queen Victoria's reign. Wealthy landowners would have their children taught at home, and some tradesmen in the area would send their children to a private school. The children of the poor had to go to work as soon as they were old enough to earn money for the family. 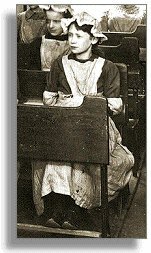 By the end of the Victorian period free schools were provided and it became compulsory for all children to go to school. Two local schools have their own websites. Click on the links below to visit them. We haven't got boots for school !